Mike, cricketeer extraordinaire, meets Psmith, a whimsical boy whose last name is pronounced with a silent "p" (as in pshrimp). Both are kicked out of their respective respectable schools and are sent to a small school Sedleigh, whose cricket team leaves much to be desired. In this lighthearted tale, the two fast friends turn Sedleigh upside-down with Psmith's smooth-talking connivery, Mike's passion for cricket, and any proper English schoolboy's good, old-fashioned prank. 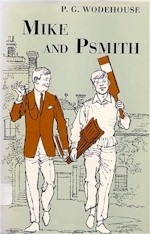 Mike & Psmith was an amazing book and was very readable, especially for a novel written in 1919. There is definitely a lot of cricket terminology and some slang throughout the book (I would suggest looking up a video explaining the sport or skipping the cricket sections entirely) but Mike and especially Psmith will be characters after your own heart. It was fun to read and had its own brand of understated humor, giving me a hilarious outlook of English boarding school. It doesn't matter if you're a boy or a girl for this book; there is no romance, but all will enjoy reading this story. It's a great way to read older literature without being bored out of your skull, but it may get complicated for readers used to modern-day lit. Even so, I encourage you to challenge yourself! You may discover that you like the book enough to continue the Psmith series.